A proper fall protection system consisting of three key components is the best way to help protect those working while at height. Let’s break those components down. 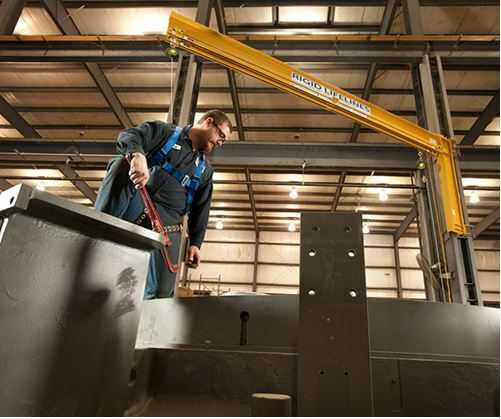 Your fall protection system starts with the right tie-off equipment. Secure tie-off points are essential to an effective fall protection system. 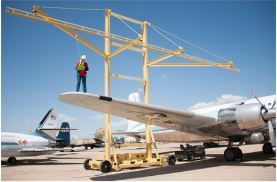 These overhead rail systems help to keep the tie-off point directly above the worker, which minimizes both free fall and swing fall hazards for a reduced risk for injury in the event of a fall. Choose between ceiling or column mounted depending on how much space you have to work with at your facility. There are also mobile options that can travel from station to station as well. You want to connect your workers to the tie-off in the safest manner possible, and a good fall arrest lanyard is the right choice for this task. A self-retracting lanyard can effectively provide the secure connection needed to keep an employee to the tie-off and reduce momentum in the instance of a fall. They offer a slip-braking system that aids in decreasing the arresting force associated with a fall, which also can increase the chance for self-rescue. The final piece in a fall protection system is the safety harness. A quality full-body harness will only enhance your fall protection system, and provides the user with prominent features to help ensure safety when at height. Look for quick connecting buckles will help create a perfect (and secure) fit for the wearer, and built-in pads will protect stitching leading to increased longevity. With these key fall protection units, you can form a complete safety system that will keep workers safer in situations where being at height is required.